Reflecting a university's long history as a beacon for Chinese students, Stony Brook's restaurant scene is comforting and familiar. For the rest of us, it's a complex, irresistible feast. Chili-scorched chicken, cumin-showered lamb, hand-stretched noodles, treasure-filled hot pots. These new arrivals on Long Island’s Chinese restaurant menus can be found in profusion inside the narrow triangle whose points are Selden to the east, Centereach to the west and Setauket to the north. This is Stony Brook Chinatown, and it may be the most exciting place to eat on Long Island right now. Ten years ago, Chinese restaurants in and around the university served the same egg rolls, sesame chicken and orange beef found all over Nassau and Suffolk. Nominally Chinese, these dishes are, in fact, exemplars of a hybrid cuisine that evolved over decades, as immigrant chefs modified their food to appeal to the American palate. In 2009, Beijing-born Tony Chen launched an authentic Chinese shot across the bows of local restaurants. Noting an increase of Chinese students at Stony Brook University, he opened Tao’s Delicacies in an unassuming Selden strip mall. At the time, he was cooking for the Three Village Central School District, and he was well aware there was no true Chinese food for miles. But almost from the start, the students wanted to know the address of the restaurant. And somehow, they made the seven-mile trip to Selden. “At first we weren’t really a restaurant,” he said. “But every day we were packed.” From Chen’s kitchen issued pork and noodles in a sour broth, stubby Northern-style dumplings, and plenty of bones, heads and innards. Chen was the first to capitalize on Stony Brook’s surging Chinese enrollment, but not the last. Over the years, more than 10 restaurants have opened within seven miles of the university. Chinese students make up a majority of their clientele, but they also have been a godsend for American fans of real Chinese food. As he approached graduation, Yao, who studied mathematics and mechanical engineering, was having trouble finding a job. “I didn’t have a green card, and no one wanted to hire me,” he said. So he suggested to his friend Phillip Zheng that they open their own business. (Zheng left the partnership in 2016.) The original idea was to open a restaurant within walking distance of campus, but the rents were too high. They found a space on Middle Country Road in Centereach, about two miles west of Tao’s. In 2015, Yao doubled the size of his dining room. The menu was eventually translated into English, and now he estimates almost half his customers are American. “But they are coming here for real Chinese food,” he said. 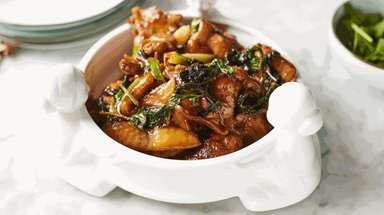 Instead of the Northeastern food Yao grew up with, though, he decided to serve a mostly Sichuan menu. “In China,” Yao said, “it’s the most popular food.” In fact, while Stony Brook’s students come from all over China (as do the area’s Chinese restaurateurs), the incendiary cooking of Sichuan province, smack in China’s center, dominates most menus. At Yao’s, the most popular dish is chongqing chicken, nuggets that are first deep-fried and then stir-fried with tiny red chilies and Sichuan peppercorns before being buried in even more chilies and sesame seeds. “Sichuan food is a national sensation,” said Jun Liu, of the university’s China Center (see page 41). He is from Shanghai. “Young people especially like spicy food — in China and here on Long Island.” A gourmand with international tastes, Liu wishes there was more variety among the area’s menus. He especially misses the subtlety of China’s Guangdong (Canton) cuisine. 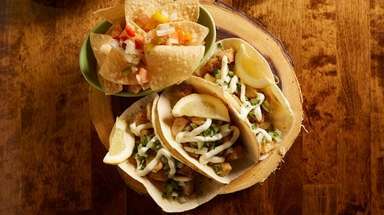 The food of the South relies on very few ingredients but absolute freshness,” he said. “With Sichuan, it’s all about the spice.” There are exceptions to the Sichuan rule. Ten89 Noodle House has a Shanghai orientation, and Red Tiger Dumpling House specializes in Shanghai-style soup dumplings, as well as dozens of varieties of Cantonese dim sum. After a year-long renovation-expansion, Tony Chen reopened Tao’s Delicacies in 2015 as Tao’s Fusion. 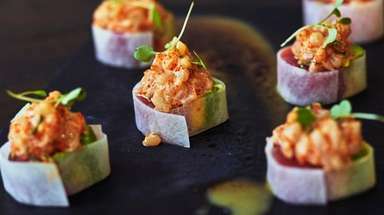 Here, “fusion” does not refer to the ubiquitous Long Island style of combining American Chinese with sushi and pad thai. Instead, Chen tries to showcase as many regional Chinese cuisines as he can. Chen also will use classic recipes as jumping-off points. He recently started making a less-incendiary version of Sichuan boiled fish, wherein fillets are poached in a cauldron of crimson chili oil. Chen’s cooking medium is a shockingly verdant broth-sauce of spinach, jalapeños and cilantro. In 2014, Chen opened Tao’s Bakery & Dim Sum, a tiny Stony Brook storefront that serves snacks and street foods from all over China — Cantonese dishes familiar from the dim sum repertoire (crystal shrimp dumplings) but also the wheaten meat pies and flatbreads of the North, and Sichuan ma la tang hot pot, whose name derives from the numbing-spicy sensation bestowed by the inclusion of Sichuan peppercorns. During orientation, a fellow student took him to Ten89 Noodle House. Next, he tried Green Tea, one of the area’s most refined restaurants, and was comforted by the sautéed string beans. “It had the right taste,” he said. 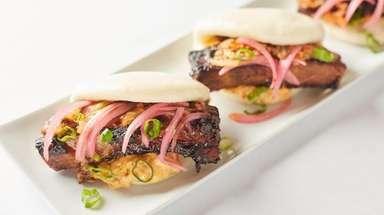 “Not identical to what I had at home — but even in China, different restaurants cook differently.” Ultimately, he found his happiest place at China Station, which opened last year. This raucous, budget-priced eatery has about 30 seats, half of them stools facing either the street or the open kitchen. 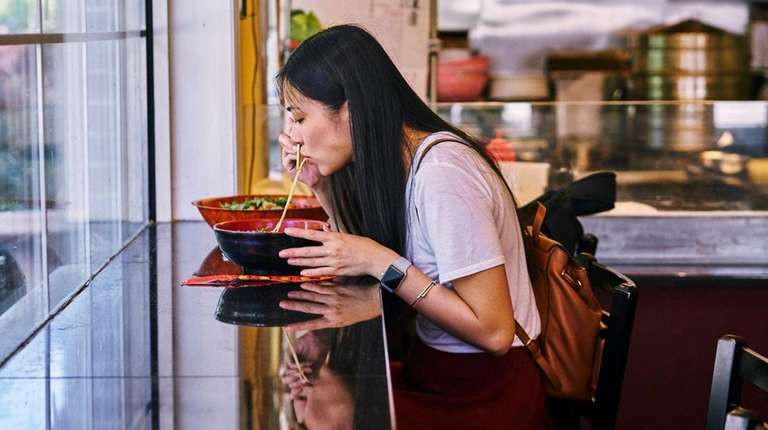 Yu comes here for the hot-and-spicy sauté pots served in enormous wood-parquet salad bowls, and the soups laden with lamien, the hand-pulled noodles of Gansu province, which neighbors Sichuan. Through China Station’s front window, you can usually see a fellow stretching, folding and stretching the supple wheat dough into ever-thinner strands. What’s even more extraordinary is that China Station is not the first restaurant in Stony Brook to make hand-pulled noodles; that distinction belongs to Splendid Noodle, established in 2016, four miles to the south. With a smaller menu and a more sedate vibe, Splendid Noodle more than earns its name. The best soups feature beef tendon and pork intestine, both of which are outshone by the cold noodles, smothered with fragrant, savory minced pork and garnished with plenty of cilantro and cucumber to cut the richness and heat. Such culinary riches would have been unimaginable a decade ago — and still are in most corners of Nassau and Suffolk. But in Stony Brook Chinatown, the food just keeps getting better. Today, out of 27,000 students enrolled at Stony Brook University, about 10 percent come from Mainland China. In fact, more than half of all international students at SBU are Chinese. Liu travels to China three or four times a year, often in the company of other SBU colleagues. In the spring, he was joined by university president Samuel L. Stanley on a three-city tour (Beijing, Shanghai, Guangzhou). “With the Chinese economy booming,” Liu explained, “parents can afford to send their children abroad. And they consider the USA to be the top destination.” Over the past five years, he said, there has been a 326 percent increase in the number of Chinese students enrolled in U.S. universities. But it also has a China connection that goes back more than 50 years: Chen-Ning Yang, the Chinese physicist who taught at Stony Brook from 1965 until 1999. In 1957, Yang and his partner, Tsung-Dao Lee, became the first Chinese citizens to win the Nobel Prize. Although both worked in America, they became superstars in China, and, throughout his career, Yang advocated closer ties between the countries. When he retired from Stony Brook, he returned to China and became honorary director of Beijing’s prestigious Tsinghua University. LI's best Chinese restaurants of 2018Newsday's picks for the top Chinese restaurants of the year.